Winter was ending by the time I turned up. The weather system nicknamed The Beast from the East by the media had combined with Storm Emma to bring freezing conditions, blizzards and strong winds to the UK. This late season storm had been the last blast of winter. It had been gone a week when I visited the Black Mountains in the Brecon Beacons, but I could see the remnants of this wild weather. Field systems were outlined in white by lingering snow drifts. The sides of country lanes were piled deep in the snow that tractors and snowploughs had cleared. The mountains were lined with snow that was hiding from the thaw in banks and gullies. It made the landscape even prettier, but I had been hoping that there would be more snow and ice so that I could use my crampons and ice axe for one last time this winter. As it was, there was still enough snow to make the going interesting. Looking towards the slopes of Waun Fach from the Dragon’s Back. Snow had drifted into the paths and old lanes that ran between hedgerows. Some of the snow was firm enough to kick steps in and walk easily. Other snow drifts were slip-sliding slush. The thaw also meant that streams were forming under these snow-covered paths. Occasionally my foot would go through a mini-snow bridge and down into the stream. Although it might not sound it, I actually found walking along these paths fun. 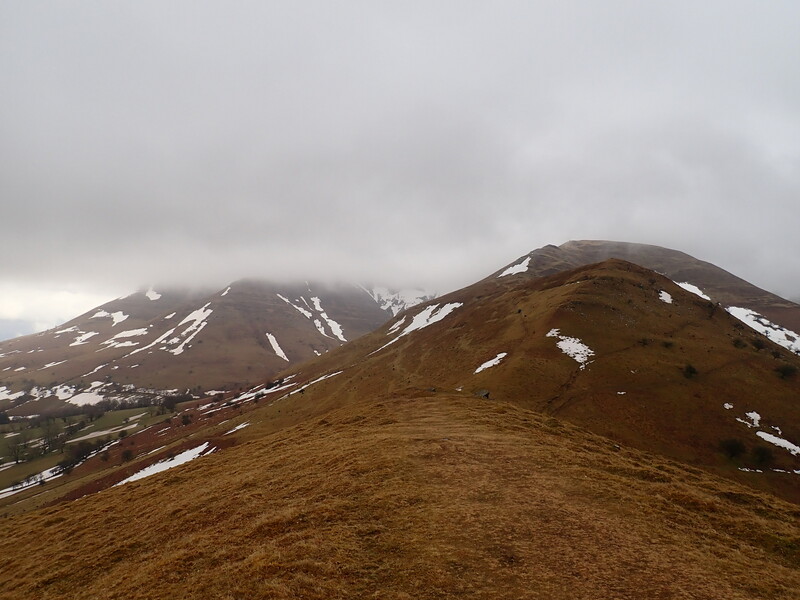 One of these snow-filled paths ran around the side of Castell Dinas, a ruined castle sitting on a small hill overlooking the Rhiangoll pass. All that remains of it are a few bits of broken wall and the outlines of overgrown ditches and ramparts. It’s still interesting – you can almost imagine its former grandeur from those remains. Castell Dinas also has great views, including of the Dragon’s Back. 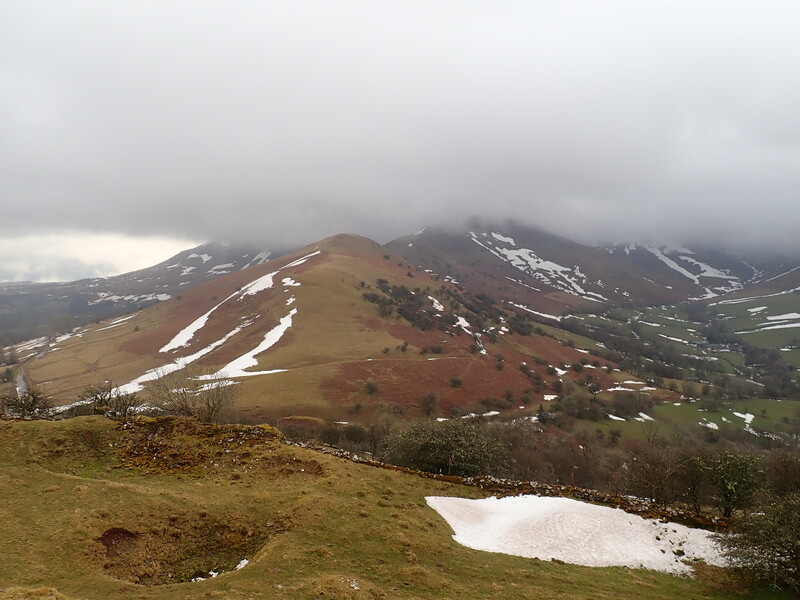 The Dragon’s Back is the name often given to the undulating ridge of Y Grib. 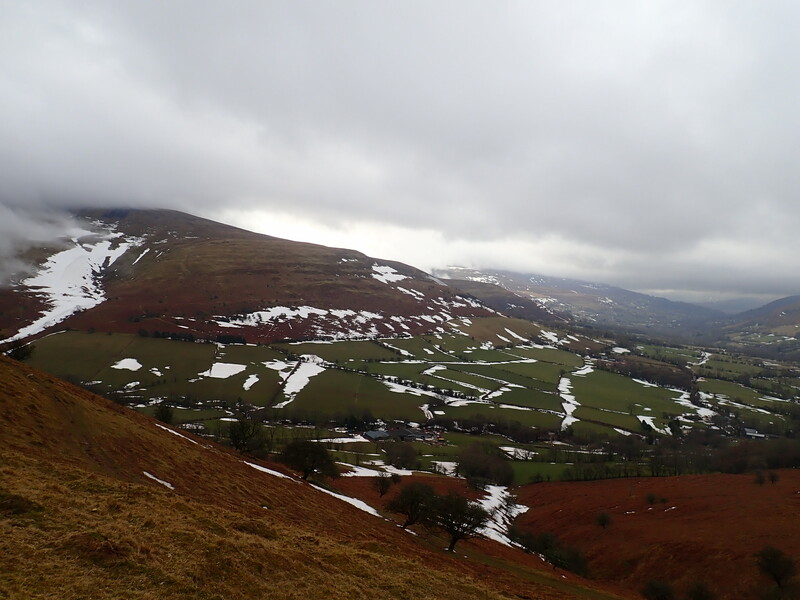 This is an enjoyable and interesting route up to the top of the Black Mountains (although it would have been even more fun if it were covered in snow). From the top of the Dragon’s Back I headed towards Waun Fach, the highest peak in the Black Mountains. 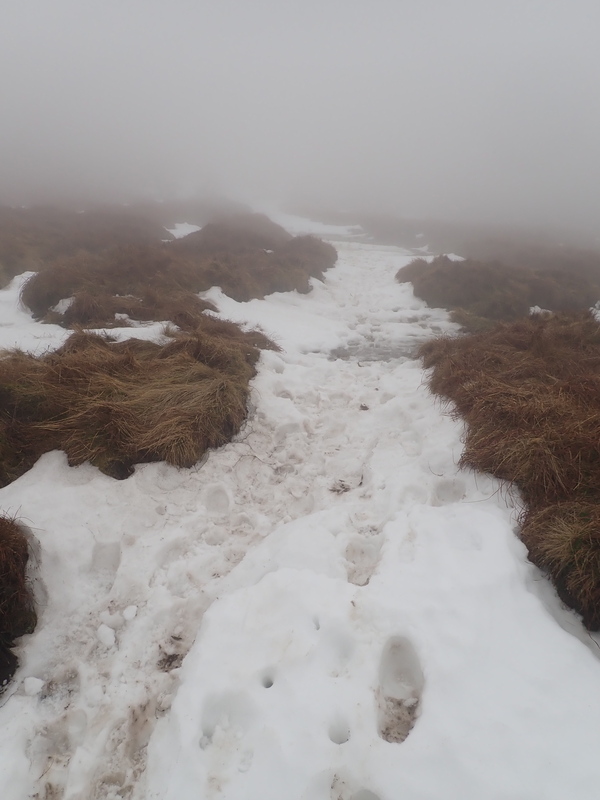 It’s got a reputation as being a boggy walk, so it was great that the bog and the paths were often hidden under melting snow. With the cloud down and my hood down against the rain, the snow made the walk more engaging and the moorland prettier. However, the highest point wasn’t the high point of this walk. 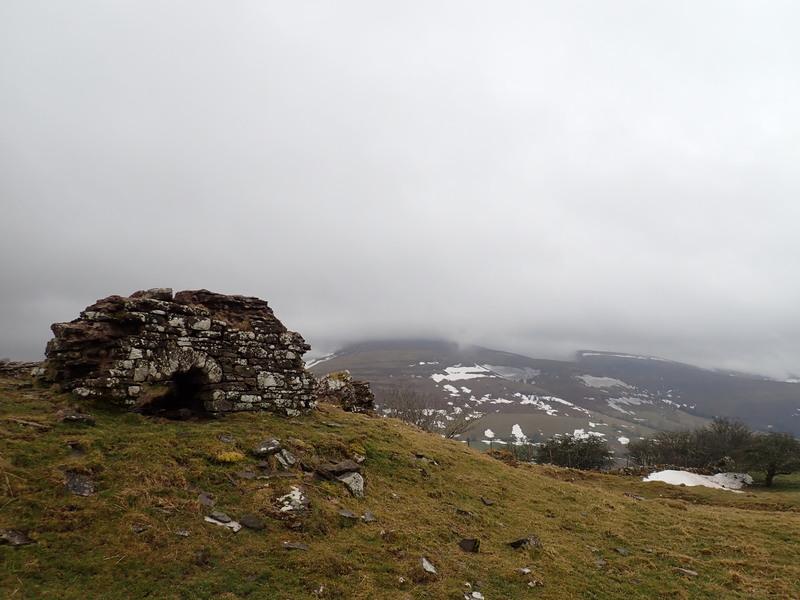 The summit of Waun Fach was a bit disappointing – a bit of moorland just a bit higher than the rest of the moor and with no views because of the cloud. 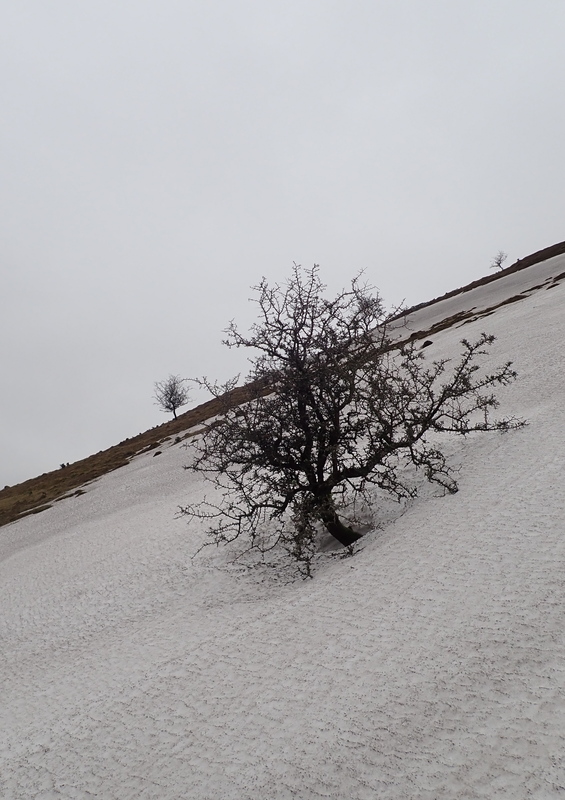 A lone tree in drifted snow on the slopes of Waun Fach. The walk back to the valley was more interesting. I descended a ridge to a saddle, then made my way back across the side of the mountain and through farmland to where I had started. What made this interesting were the different shapes of the snow banks and drifts, including seeing bits of the countryside slowing emerging from them. The storms the previous week had been the sting in the tail of this winter and this walk had a sting in the tail for me. I took a slip on the descent. This slip wasn’t on any of the snow, just on regular, boring mud. This slip wouldn’t normally have amounted to much, except that I got my leg twisted under me as I slid. Although I managed to walk on, something is now not right with my knee and I’ve booked myself in to see a doctor. This is how my winter ended. A bit of a bad note, but hopefully everything will be alright for the start of next winter. I broke my wrist badly on mud – just after I’d come back from doing the Skye Cuillin too! I wouldn’t say winter is ending – not for a month or so at least – the cold and bad weather is on its way back by this weekend. I hate winter and wish it would go – ours started on 2 September! It does seem to be making a one, last, brief return this weekend. Like a wintery hiccup. I don’t mind winter and I love being in snowy mountains. The only thing I dislike about it is that so often the winters in the UK are just damp and grey. Sorry about your wrist. That’s got to be frustrating and I imagine it was seriously painful at the time. I think I prefer damp and grey as I just can’t stand the levels of cold we get in this country otherwise – at least those damp winters are warm. The wrist was quite frustrating but was only the standard 6 weeks despite having to be pinned – the toe I broke on the day I had my wrist pot off was 3 months!